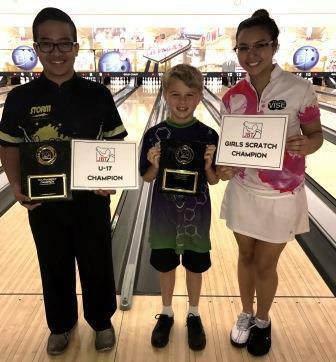 Youth was served at the JBT Mojave Invitational, as Cerell Cardines, Gage Baker, and Leah Glazer captured titled in the prestigious event, hosted by Gold Coast Lanes. Cardines dominated in the U-17 side events all year, but was a factor every week in the main scratch division as well, as evidenced by his runner-up performance in the points race. After winning the Invitational in 2015 as a 15-year old, Cortez Schenck took the title in 2016. In the 2017 grudge match, he capped off his excellent Mojave season with the win over Cortez, and $1,000 top scholarship prize. Main Event champ Leah Glazer continued to put on her best performances in our biggest events, making the main cut and finishing 15th, then beating Alyssa Tucker for the Girls Scratch win. Cardines swept his divisions with a U-17 title game win over top seed Kyle Wilson. Those were great stories, but the talk of the event was 8 year-old Gage Baker, son of PBA legend Mark, who put on a heck of a show in the handicap division. After beating red-hot Avery Domaguin, he took on Alyssa Tucker for the title, and was able to defeat her for the title and $1,000 scholarship payday, becoming the second youngest bowler behind Ashley Lamb to win a JBT Invitational. Big thanks to the crew at Gold Coast for hosting our event, which awarded over $5,000 to bowlers of all ages and averages. Want in on all this? Just check out our schedule and come on down!